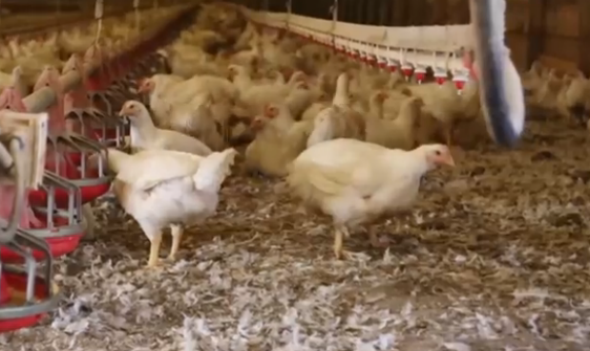 South Carolina chicken killings: At least 300,000 birds dead. Footage from one of the victimized farms. Vandals bypassed alarms systems and raised or lowered temperature in the chicken houses, killing them, Garrett said. “Depending on the age of the birds, they knew whether to jack the heat up or jack the heat off,” Garrett said. Young birds need more heat, and older ones need less, he said. “They had all that knowledge of the farms and how many weeks growth the chickens were,” Garrett said. When he walked into one of the chicken houses, he said it was like a sheet of white – almost like snow – that wasn’t moving. The ventilation was shut off and the temperature inside of the house was turned up to 115 degrees. Pilgrim’s Pride is the nation’s largest poultry producer and recently laid off 60 employees from a plant in the city of Sumter, Reuters says.